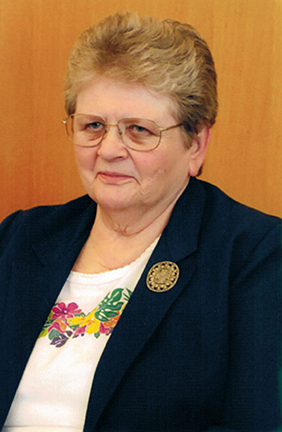 Sister Glenna Raybell, 83, a member of the Benedictine Sisters of Annunciation Monastery, Bismarck, entered eternal life Monday, April 18, 2016, at a Bismarck care center. Mass of Christian burial is scheduled for 9:30 a.m. today April 20 in the Chapel of Annunciation Monastery. A vigil was held last night. Glenna Jean was born June 29, 1932, in Paulsbo, Wash. She was the second of four children of Glen Elwood and Ruby Elizabeth (Nupp) Raybell. She and her two sisters and brother grew up in the state of Washington. She entered Annunciation Monastery in 1953 and was given the name, Sister Peter. She later changed to her birth name of Glenna. Sister Glenna made monastic profession July 11, 1955. An intelligent woman with a passion for social justice, she was generous in helping those in need. Sister Glenna served people as a teacher, social worker and canon lawyer. She earned bachelor’s degrees in elementary and secondary education from the University of Mary, a master’s degree in social work from the University of Illinois and a licentiate in canon law from St. Paul’s Pontifical University, Ottawa, Canada. She taught in Catholic elementary and secondary schools in Bismarck, Mandan and Dickinson. As a social worker, she worked in Chicago, Michigan and at St. Alexius Medical Center in Bismarck. She taught social work for colleges in South Dakota. One of her ministries in Chicago was director of a federal program providing basic education for the poor. She also worked for the VA Hospital in a tri-state area covering South Dakota, Iowa and Minnesota. Sister Glenna was appointed to state government boards including the Governor’s Commission on the Status of Women and the North Dakota Parole Board. After her studies in canon and civil law, Sister Glenna served as associate director of the San Diego and Fresno Tribunals in California. A steadfast woman, she was not afraid to express her views openly especially when it came to championing the downtrodden. She may have seemed tough on the outside but inside she had a warm, soft heart. After her retirement, she continued her interest in social justice issues and her commitment to the welfare of military veterans. Sister Glenna is survived by a sister, Janice (George) Vocke, Shelton, Wash., three nephews, two grandnephews, one grandniece, and the Sisters of Annunciation Monastery.